Frivolous At Heart » First Grade Bumble Bee Project! First Grade Bumble Bee Project! 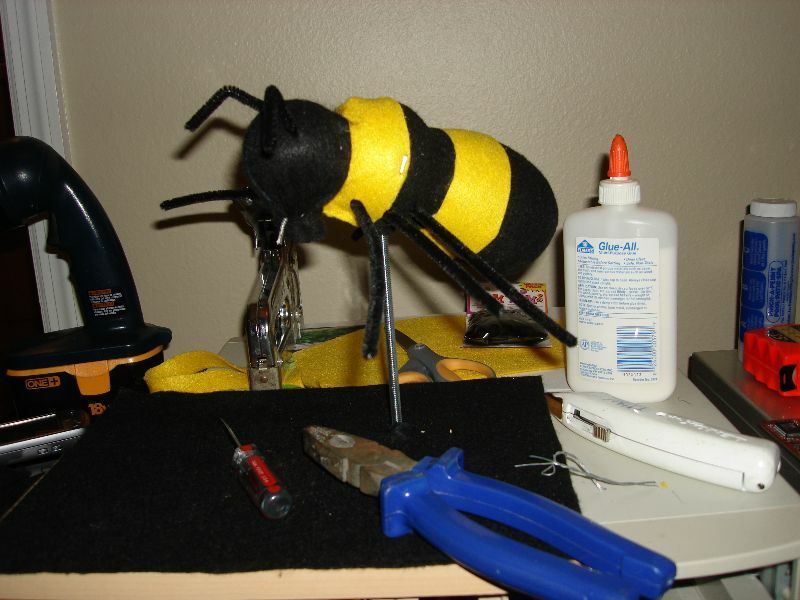 I was contemplating on how I should piece together a bumble bee for my nephew. His class requires that he builds a bumble bee from scratch. Other students are assigned different animals of course. I originally was going to cut mine out from the wood lathe but decided that would be too much work. I went to Michaels and purchased a swan egg and two round spheres. Went home and cut them to add a marginal degree to the bumble bee’s body. Worked out great and the shape was just right! I of course, did all the “dangerous” work because my nephew can’t use my mitering saw, my drill, and my staple gun. He helped with the other “stuff” to piece together this project and I have to say, he was quite unhelpful- okay, I was a hog. He really couldn’t do anything but glue stuff and cut shapes out for me which is more than enough of assistance I could use of him. Tomorrow, I, excuse me, “we” need to make wings for the bee and finish up the project. I need a fine metal brush to brush the felt to make it more fuzzy and puffy. I’ll have to figure something out tomorrow. Then after fruition, we would need to school my nephew on bumble bees and etc. Wouldn’t want the teacher to pull a quick one on him!